CJ13. 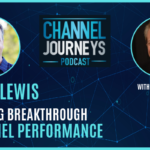 This episode features Lorna Garey, Editor-in-Chief of Channel Partners and Channel Futures. She is also the producer of the Channel Partners events including the CP Expo 2019 in Vegas where the theme is Channel Disruption. Lorna launched her journalism career in the Army working under the general of the 2nd Armored Division. She even has the Hell on Wheels patch. Lorna shares an insider’s view of the continued growth of the Channel Partners events in this period of disruption, how the channel publication world is evolving, and how channel professionals can grow their business and their careers. [3:50] Channel Partners event takes place April 9-12 in Las Vegas. This is the 22nd anniversary of the CP Expo and the 5th that Loran has been the producer. The event has doubled in size and revenue in those 5 year. Twenty-two years ago they had 200 participants. This year they’re expecting 6200. [4:50] Theme this year is disruption and the uber-ization of business. The channel is not dying, but it is changing. You can either change your business or wait for a born-in-the-cloud business to change it for you. [6:00] About 50% of the partners at the spring Channel Partners event are agents. The fall CP Evolution show in DC is predominantly MSPs. A burning question is will the agent and MSP models merge? [7:30] Of the 6200 attending CP Vegas, about 60% are partners, up 10% over last year. Most of the rest are distributors, master agents, and suppliers. [8:30] Channel Partners Evolution taking place this fall in DC with a predominantly MSP audience. [9:50] New this year – launching the first Channel Partners international event. It’s taking place at the Park Plaza London very close to Windsor Palace in December. [10:50] Lorna got her start in the channel when she was asked to join Channel Partners. She’d never heard of the channel, which she sees as one of the problems of mainstream tech journalism. [14:00] Hired a millennial editor, James Anderson, right out of the Walter Cronkite School of Journalism. James launched Channel NX2Z a group dedicated to helping the next generation of thought leaders see the channel as a career path. [18:00] When Lorna joined the Army, she was requisitioned to Ft. Hood, Tx by the commanding general of the Patton’s 2nd Armored Division and she even has the Hell on Wheels patch. The general asked Lorna to become his graphics department for briefings. [19:30] Lorna was stationed in German before the wall came down. Her biggest adventure was going into East German through Check Point Charlie. That showed her the night and day difference between Communism and Capitalism. [23:20] What kind of stories get the most attention? If it bleeds, it leads. Channel stories about layoffs, bankruptcies, other problems get the most attention. In positive news, open source, security, PSA, and RMM content is king on Channel Futures. 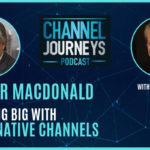 On Channel Partners, stories on business models and how to add monthly recurring revenue get a lot of attention. LinkedIn is the most popular site for readership. [27:00] Vendors can speak at CP events through paid slots and be featured on Channel Partners online through contributed content. Channel Partners is one of the few sites that accepts content from suppliers. That could lead to a speaking spot at a CP event.